Hello... Hello ... my old friends ... It's great to see you once again! It looks as if the lead singles for the new Jeff Lynne album "Long Wave" in the USA and UK will be "Mercy Mercy" [USA] and "At Last" [UK] respectively, judging from the airplay and reviews out there that are starting to spread out over the airwaves and internet. And over in the States, Rolling Stone have just published exclusively the first new Jeff Lynne promo music video for over two  decades for "Mercy Mercy" - which reminds me a little of the 1980 music video for "Coming Up" by Paul McCartney. Add to that the increasing number of positive reviews for both the lead singles and it looks like the ELO & Jeff Lynne media machine is ramping up nicely for those twin album releases. A four  page feature including a double page picture of Jeff Lynne and ELO is also due for publication in the November 2012 issue of MOJO magazine! 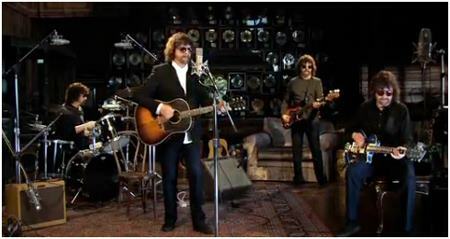 Jeff Lynne interview - Why re-record those ELO classics? So check out the video and, in the meantime, get your pre-orders in for maximum album chart impact on the 5th, 8th or 9th October - depending on where you reside!